Performance by Australia Ensemble, Paul McMahon from the CD Works by Peggy Glanville-Hicks and Malcolm Williamson. Works by Peggy Glanville-Hicks and Malcolm Williamson. Profiles from China : for voice, piano and strings / Peggy Glanville-Hicks ; text by EuniceTietjens. The songs / Peggy Glanville-Hicks. One hand on the manuscript. 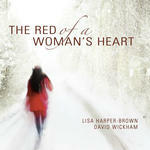 The red of a woman's heart : Australian art songs / Allen, Glanville-Hicks, Hanson, Phillips, Sutherland ; performer by Lisa Harper-Brown and David Wickham. Profiles from China : [for voice and piano] / music by P. Glanville-Hicks ; text by Eunice Tietjens. Profiles from China : [voice and string quartet] / P. Glanville-Hicks ; [text by Eunice Tietjens]. Instrumentation: Tenor, piano, 2 violins, viola, cello, double bass. Contents note: 1. Poetics -- 2. Lament of scarlet cloud -- 3. The dream -- 4. Crepuscule -- 5. The son of heaven. 19 May 2012: at Australia Ensemble @ UNSW (Sir John Clancy Auditorium). Featuring Australia Ensemble, Paul McMahon.